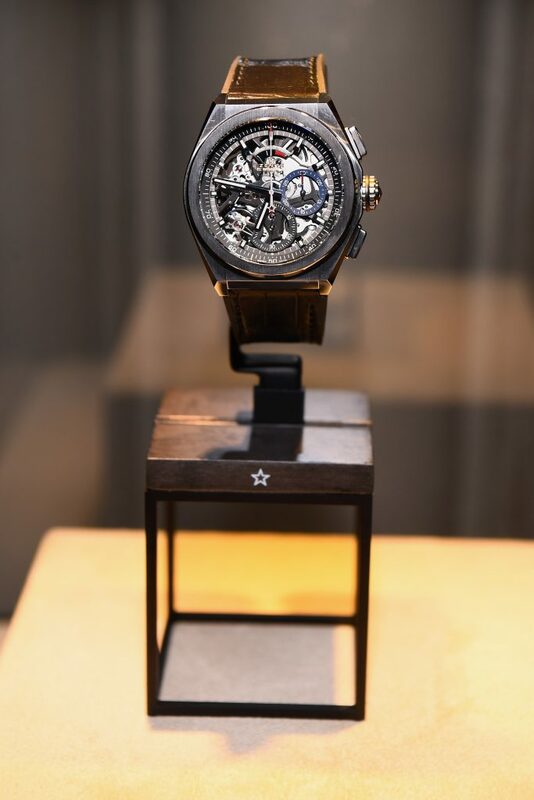 After an incredible unveiling of the highly technical and revolutionary Zenith Defy Lab watch earlier this year in Switzerland, the brand struts its stuff in New York City (and recently also at Art Basel Miami) with a premier line up of celebrities and Defy watches that seem to be taking the collector market by storm. At the recent New York City event, famed recording artist Swizz Beatz not only attended, but also, in alignment with Zenith, unveiled and raffled off the Defy El Primero 21 Swizz Beatz watch. With Julien Tornare, CEO of Zenith, hosting the event at the historic church-turned-venue Angel Orensanz Center in New York City, the evening shed light on the Defy collection, including the Defy El Primero 21 and Defy Lab. 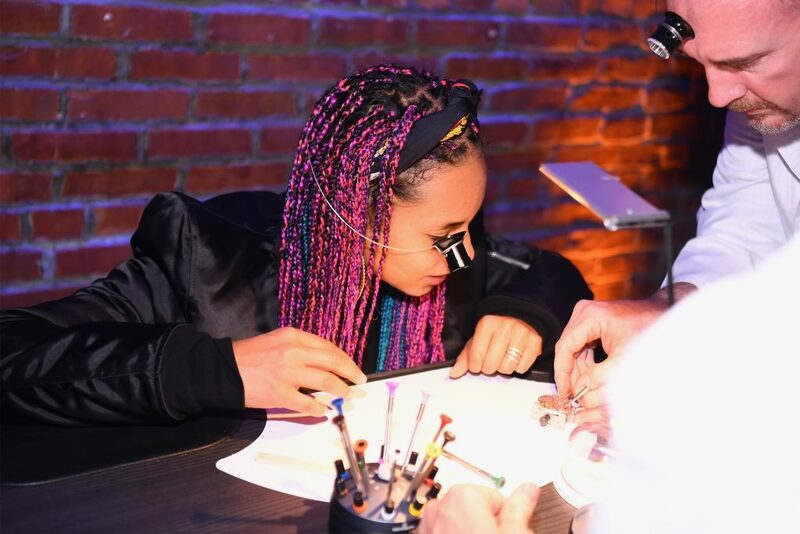 While the evening was filled with appearances by Alicia Keys and Fabolous, it was really about getting closer to the Zenith brand and the extraordinary craftsmanship and history the company possesses. Of course, with a state-of-the-art DJI Phantom 4 Pro drone flying in to deliver the one-of-a-kind Defy El Primero 21 Swizz Beatz Edition Unique, history was a bit upstaged. However, that seems to be the defining new direction of Zenith: combine lively modernity with rich benchmark matchmaking and propel the brand firmly into the future. Julien Tornare, recently appointed to the CEO position, is just the right man to make this transition for the brand, taking it from sleeping to leaping. Young, energetic and not afraid to speak out about the watch industry’s ups, downs and inside-outs, Tornare has been in the business a long time. However, we digress. Expect more about him and the brand coming soon. 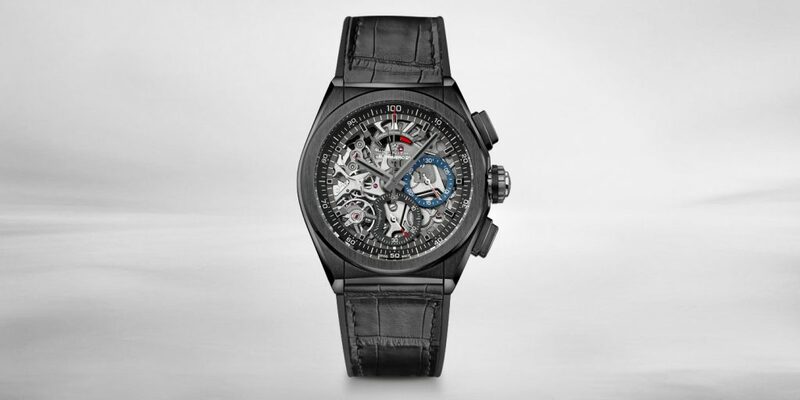 In the meantime, we should note that the special edition Swizz Beatz watch houses the incredibly complex movement that the Zenith Defy El Primero 21 houses — a 1/100th of a second chronograph caliber. The watch houses two escapements, one for the hours and minutes timing beating at 36,000 vph/5 Hz, and one for the chronograph beating at 360,000 vph/50 Hz. 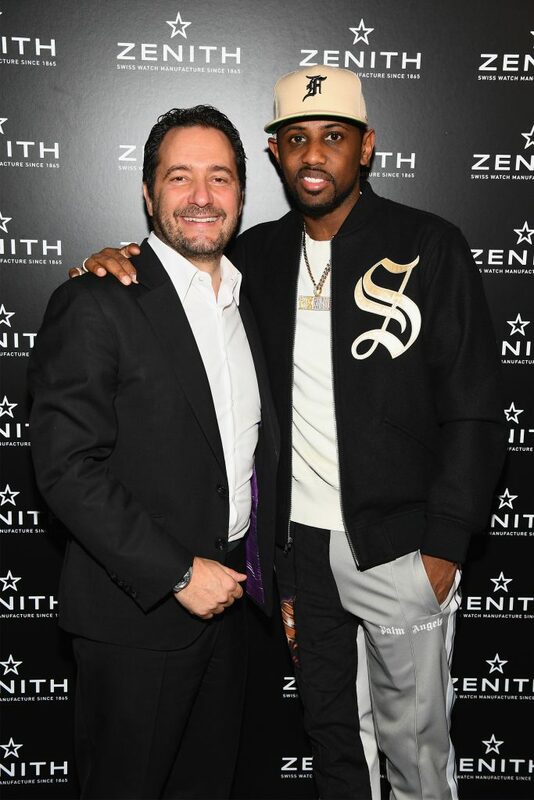 CEO of Zenith Julien Tornare (L) and rapper Fabolous pose as Zenith Watches and Swizz Beatz celebrate the launch of The Defy Collection at the Angel Orensanz Center on November 30, 2017 in New York City. (Photo by Dave Kotinsky/Getty Images for Zenith)Meanwhile, back to the Zenith Defy El Primero 21 Swizz Beatz Edition Unique watch. 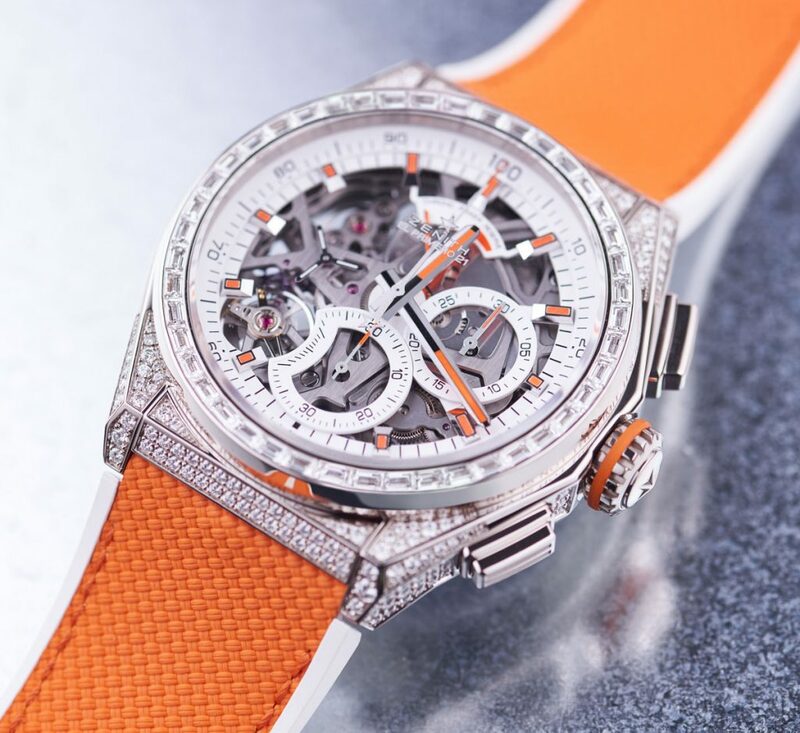 Offered with a bright orange strap that matches the orange accents on the white dial, the 44mm white gold watch is set with 288 round diamonds and 44 baguette-cut diamonds on the bezel. The strap and the bezel are engraved with inspirational words from musician and producer, Swizz Beatz: “Never let people tell you what you can’t do, because sky’s not the limit, it’s just the view.” Just five pieces are being made, with the No. 1 belonging to Swizz Beatz and one being raffled off that night. To participate in the raffle, guests could purchase a ticket for $100, with all of the porches going to support the Gathering for Justice, an organization originally founded a dozen years ago by Harry Belafonte and dedicated to stopping child incarceration and eliminating racial inequalities in the criminal justices system. It is important to note that Zenith has had a strong music involvement over the years. In fact, the brand worked with Kiss rocker Eric Singer and Tommy Thayer (AKA, the Spaceman) on the making of its Pilot Type 20 Extra Special Limited Edition Thayer bronze watch. It has also been intimately involved with the Rolling Stones, creating a watch in tribute to the famed rock band. As such the Swizz Beatz affiliation falls right into place, as we witness Zenith ombining great product, value, pioneering thinking and modern narratives in a fascinating new chapter in time measurement. Stay tuned, we will be bringing you more about that soon.